Switch off the mains power. Disconnect all cables, labelling each one so you can replace it later. Remove the three rear cover screws with a Posidriv screwdriver and the side screws (if fitted). Lift off the Cover. Remove all screws and the tuner nuts from the rear (13mm spanner). Push a pair of small cutters through the side panel holes and gently lift up each rivet head 2 - 3mm. Now grip the rivet base and lift the two-part moulded rivet out of the hole. Replacement is the exact reverse. If the rivet is brittle, that indicates that the unit has been too hot inside. Relocate it to a cooler position before use. Fit *new* rivets if the old ones are damaged. Carefully pull upwards any ribbon cables that are fitted. Do not kink or bend these when you replace them or you will crack the fragile copper conductors. Be careful not to knock any components or you might damage their connections beneath the board. Remember that some capacitors might still hold a high voltage unless the power has been disconnected for several hours. Such voltages are not normally dangerous to you but they can damage components if you accidentally connect them with metal tools, wire or Multicore desolder wick®. Use pliers to short-circuit all the larger capacitors before you begin work. The Printed Circuit Board (PCB) rests on white plastic support pillars with a split (bifurcated) head. Use point-nose pliers or cutters to squeeze together the pillar head and gently lift the PCB clear. There may be two or three pillars to be released. DO NOT BEND the PCB or you will crack the copper tracks and ceramic components underneath! 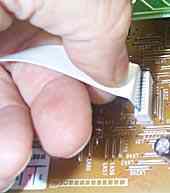 When you replace the PCB, use pliers to press it down onto the support pillars as the picture shows. If you press with your fingers you might bend the PCB. The SatCure miniature cooling fan can be secured to the PCB with blobs of RTV Silicone Sealant or with hot melt adhesive. Avoid getting sealant on components because it can be corrosive. It can also make components overheat by insulating them from the cooling air! Don't glue the fan blades! Solder the black wire to the most convenient zero volt point. In this MSS500 it was soldered to the tuner module corner. The red wire must be secured away from the high voltage section of the PSU. The SatCure Miniature Fan Kit contains resistors to slow the fan down. In this MSS500, the 160R resistor is hooked around the cathode wire (striped end) of diode D12 which supplies around 13 volts dc. Tin the diode wire with solder before hooking the resistor around it. Once the resistor is mechanically secured to the diode wire, solder it and crop off excess wire. Wrap the end of the red wire around securely the opposite wire of the resistor, apply solder and crop off the excess wire. Secure the red wire with glue to prevent its touching any source of electricity if the solder joint should break. The picture shows it glued to a support pillar. When you are working on the underside of a PCB assembly, it is important that the components on the "upper" side are not knocked or bumped. You can protect them by lying the PCB assembly upside down in the receiver chassis, using the metal sides and rear panel to support it. Additional support might be required. Remember that the transistor is glued in place as well as soldered. Place the tip of the iron on the centre leg of the transistor. Allow the solder to melt (apply a little more solder if necessary). Flip the transistor up so the glue bond is broken and it is held only by the front two soldered legs. Now touch both of these with the iron and push the transistor away. Do not damage the solder pads! Use Multicore desolder wick® to remove the old solder from the pads. Place a short length across the pads and gently press the tip of the iron down onto the wick until the solder melts into it. Be careful when you lift it up - if you leave it too long, the solder will cool and you will rip the pads off the PCB. Lift the wick while the iron tip is still on it. Apply a tiny blob of solder to the centre pad of the three. Do this as quickly as possible so that there is some flux on the pad as well. If you burn all the flux away with the iron, the end result will be a "dry joint". Offer the new tansistor towards the solder blob on the pad and touch it with the iron tip. As the solder blob melts, push the transistor the last millimetre and let the solder hold it. Remove the iron, wait a second for the solder to solidify then remove the tweezers. Now you can apply fine solder wire to the remaining two contacts. Once a soldered connection is made LEAVE IT. You will do no good by applying the iron for too long. The appearance doesn't matter, provided a connection is made and no short-circuit is created. The copper tracks are very thin and are held to the board with something like "Araldite" adhesive. Excessive heat applied for too long will degrade this adhesive and lift the copper track and solder pad. It is important to work quickly but carefully to avoid damage. You can use "Multicore desolder wick®" (copper braid impregnated with flux) to remove solder but you must NOT use a pump-action solder sucker. If you DO damage a track, you should repair it with Teflon-covered wire which should be glued down to avoid the risk that it might break and touch a live mains connection. Have a look at our Solder Kit. It's supplied at no profit to help you to be successful. 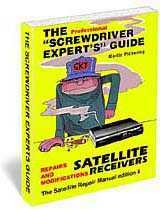 Based on the original "Screwdriver Expert's Guide to Satellite Receivers" this book describes the basic components and a typical power supply with diagrams and explanations. 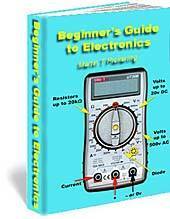 Shows how to solder and describes what to check and measure. It won't make you an expert but, if you are capable of soldering in components supplied as a kit, it will take you one step further so you understand why you are doing it and even help you figure out other possible fault causes and cures. 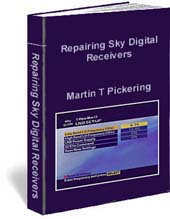 If you buy a repair kit, you need this book. I guarantee you'll be delighted with this amazing book full of information! by M T. Pickering B.Eng.